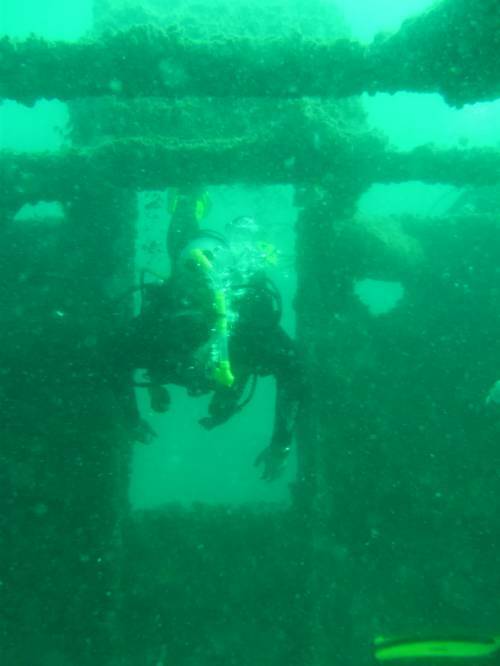 In the middle of Roy Rufus Artificial Reef is a great dive site comprisiong the 3 old ships, the Pelican (27 meters long and scuttled in 1971), the Otter (40 meters long and scuttled in 1973) and the Lass O.Gowrie of 43 meters long and scuttled in 1969. These old ships lay in an upright position on the bottom, in approximately 20 meters of water. Set out in a triangle formation, steel pickets running between them, about 4 meters apart, makes it easy to navigate around this site. Agood days vis is 15mtrs but av is only 6mtrs best diving is the winter mths. being in the sandy straits these wrecks are a haven for mass amounts of manine life.